Huawei Mate 20 Pro₹ 69,990 has started receiving a new software update that brings a Super Macro Mode functionality, as per a media report. The new update also reportedly includes the January 2019 Android security patch as well as improves the gesture-based system navigation. Earlier this month, the Mate 20 Pro got the December 2018 Android security patch. The recent update also brought improvements to the Master AI mode and optimises the face unlock performance. The Mate 20 Pro also recently received Netflix HDR and Widevine L1 support. The latest software update for the Huawei Mate 20 Pro is based on EMUI 9.0.0.183 along with C636E1OR3P2 build number and is 346MB of size, reports XDA Developers. Among other features, the update brings a Super Macro Mode. The new feature is said to be a part of the Mate 20 Pro since its launch back in October last year. However, it was previously available once users tap the zoom buttons on the viewfinder to zoom into the subject, as noted by some users on XDA Developer forums. With the update, the Super Macro Mode comes in the form of an option that can be accessed by tapping More in the camera app. The feature is believed to use artificial intelligence (AI) on the Mate 20 Pro to enable Super Macro shots. The new software update also improves the zoom shortcut with wide-angle, 1x, 3x, and 5x options in the viewfinder, as per the reported changelog. There are also improvements towards the smoothness of the gesture-based system navigation. Huawei has provided the January 2019 Android security patch through the latest software update, the report adds. Furthermore, the changelog shows update improves the call experience in certain scenarios. The latest update is apparently rolling out as an over-the-air (OTA) package. You can check its arrival on your Huawei Mate 20 Pro manually by going to the Settings menu. 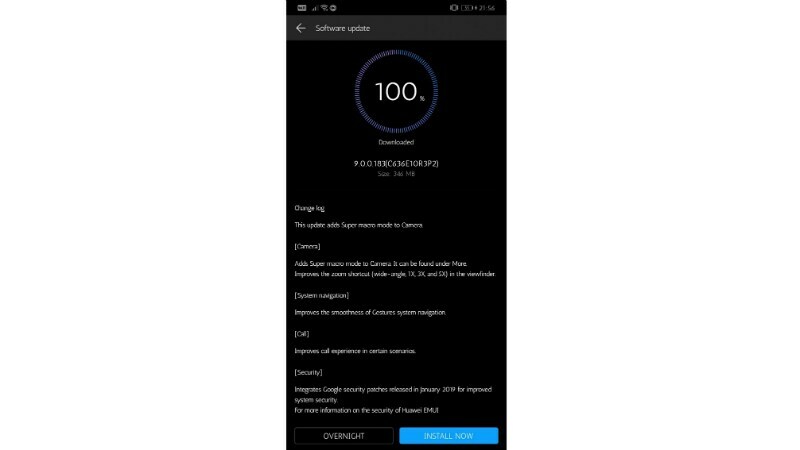 Earlier this month, Huawei released a software update for the Mate 20 Pro with the December 2018 security patch and improvements to the Master AI mode. The handset also received Netflix HDR and Widevine L1 support.